In the India, CJP is all set to hold 5 Days Global Jatropha Hi-Tech Agricultural Training Programme (JWTP10) from SEPTEMBER 20-24, 2010. 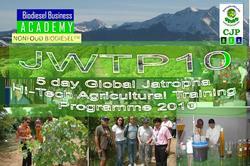 The JatrophaWorld Training Programme 2010-- the Most Authoritative platform shall introduce the A-Z of Sustainable Jatropha Production; sustainable business models; R&D progress, and application technologies, including utilization of Jatropha Crude Oil and Seedcake; besides introducing some new potential nonfood biodiesel crops badly needed by the feedstock deficit –plagued biodiesel industry worldwide. The 5 Days Global Jatropha Hi-Tech Agricultural Training Programme (JWTP10) in India from SEPTEMBER 20-24, 2010 shall provide an improved up-to-date understanding of the Jatropha nonfood biodiesel System, a Strategic plan to apply tested and proven technology ,methodology and approach to achieve the aimed continuous yield increases and a solid solution that is sustainable and delivers value from "Soil-to-Oil" via: Planting - the science and technology. Centre for Jatropha Promotion & Biodiesel (CJP) is the only premier organization that arranges the unique training for all stakeholders to provide them the opportunity to understand, learn, act and implement the Jatropha and other nonfood biodiesel plans from ground zero to Biodiesel production in a very successful manner. CJP, the inventor of Jatropha energy farming and specialist in the development of nonfood crops as a low-cost, sustainably produced oil; is turning the opportunities into reality through a world-class leadership team, unmatched resources technology and expertise and a commitment to sustainability that creates a positive impact on local environments and communities while maximizing Project ROI through Improved Agronomy. “To create, build and succeed in the growing world of biodiesel one need complete and comprehensive knowledge of Plant science and Plant technology and just registering yourself for the mega happenings , you can ensure the same as this is the only platform to understand & learn, to plan and execute, the best expertise to discuss and analyze the present and future dynamics of JATROPHA, nonfood crops from a technological and socio-economic angle. Registration is open. Secure your seat today. He concluded. CJP is engaged in scientific commercialization of non-food fuel crop- that designs and implements the growing of various OSBT crops worldwide in a structured Agri-Supply chain, Value additions of inedible oil seeds and research activities thereon & provides support/services from "Soil to Oil" for development and establishment of the non -food Bio-fuel crops. based on its proprietary knowledge plant science expertise enhanced technology and extensive experience and by integrating technical and managerial issues CJP has developed Jatropha Agricultural Training package (JWTP) to deliver Competencies through Qualified trainers with a practical 'hands on' approach. The 5 Days Global Jatropha Hi-Tech Agricultural Training Programme shall be from September 20-24, 2010 in Rajasthan, India shall be a sole solution to all prospective stakeholders to know the Jatropha in real form from Plant science to Plant technology. JWTP10 is unique because of the capability to deliver an integrated "One Stop Solution” for Jatropha Agri-business operations to the agricultural and energy sector worldwide.